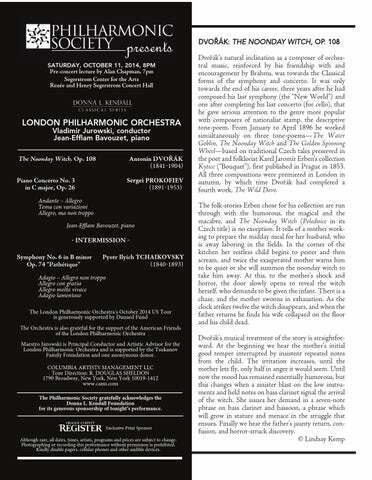 Adagio – Allegro non troppo Allegro con grazia Allegro molto vivace Adagio lamentoso The London Philharmonic Orchestra's October 2014 US Tour is generously supported by Dunard Fund The Orchestra is also grateful for the support of the American Friends of the London Philharmonic Orchestra Maestro Jurowski is Principal Conductor and Artistic Advisor for the London Philharmonic Orchestra and is supported by the Tsukanov Family Foundation and one anonymous donor. COLUMBIA ARTISTS MANAGEMENT LLC Tour Direction: R. DOUGLAS SHELDON 1790 Broadway, New York, New York 10019-1412 www.cami.com The Philharmonic Society gratefully acknowledges the Donna L. Kendall Foundation for its generous sponsorship of tonight’s performance. and slow music. It begins with a dark-colored slow introduction, a late addition to the score which anticipates the striving first subject of the main Allegro. Then the second subject consists of a whole extended paragraph of slower music: a consoling D major string melody, a contrasting “middle section,” and an impassioned return to the string melody, echoed by a clarinet solo dying away to nothing. The fastest section of the movement is the development, which begins with a furious fugato, later overlaid by striding descending scales in the trumpets, and falls away to a solemn brass chorale which is in fact a chant from the Russian Orthodox funeral service, “With thy saints, O Christ, give peace to the soul of thy servant.” The recapitulation, launched at the peak of a new build-up of excitement, is a much altered and truncated version of the exposition, with a huge descending scale leading to a shortened version of the second subject (without its middle section), and a subdued coda. The two middle movements are both character-pieces of an unusual nature. The D major Allegro con grazia (“with grace”) is waltz-like, but in a consistent 5/4 time. The standard pattern of a trio section and a reprise of the opening is expanded by a transition from the trio which juxtaposes phrases from both sections, and a coda beginning with scale patterns, rising quickly and falling slowly. The Allegro molto vivace, in G major, is a brilliant march, largely concerned with building up anticipation, so that the final return of the main theme takes on a triumphant quality. But then the slow finale begins with a despairing melody, its scalewise descents initially shared note by note between first and second violins; and a descending scale in the bassoons leads to a major-key second theme which also begins with fragments of downward scales. This is driven to a climax, but then makes way for the extended return of the first theme in mounting waves of passion. Finally the downward scales that have increasingly dominated the whole work take over again, in a kind of vestigial minor-key return of the second subject, descending to the lowest depths of the orchestra before falling silent. © Anthony Burton LoNDoN pHILHARMoNIC oRCHeSTRA Recognized today as one of the finest orchestras on the international stage, the London Philharmonic Orchestra balances a long and distinguished history with a reputation as one of the UK’s most forward-looking ensembles. lpo.org.uk facebook.com/londonphilharmonicorchestra twitter.com/LPOrchestra vLADIMIR juRowSkI, CoNDuCToR One of today’s most sought-after and dynamic conductors, acclaimed worldwide for his incisive musicianship and adventurous artistic commitment, Vladimir Jurowski was born in Moscow, and completed the first part of his musical studies at the Music College of the Moscow Conservatory. In 1990 he relocated with his family to Germany, continuing his studies at the High Schools of Music in Dresden and Berlin. In 1995 he made his international debut at the Wexford Festival conducting Rimsky-Korsakov’s May Night, and the same year saw his debut at the Royal Opera House, Covent Garden, with Nabucco. Vladimir Jurowski was appointed Principal Guest Conductor of the London Philharmonic Orchestra in 2003, becoming the Orchestra’s Principal Conductor in September 2007. He also holds the titles of Principal Artist of the Orchestra of the Age of Enlightenment and Artistic Director of the Russian State Academic Symphony Orchestra. He has also held the positions of First Kapellmeister of the Komische Oper, Berlin (1997–2001); Principal Guest Conductor of the Teatro Comunale di Bologna (2000–03); Principal Guest Conductor of the Russian National Orchestra (2005–09); and Music Director of Glyndebourne Festival Opera (2001–13). Vladimir Jurowski has appeared on the podium with many leading orchestras in Europe and North America including the Berlin and Vienna Philharmonic orchestras, the Royal Concertgebouw Orchestra, The Philadelphia Orchestra, the Boston and Chicago symphony orchestras, the Tonhalle-Orchester Zürich, the Gewandhausorchester Leipzig, and the Staatskapelle Dresden. Highlights of the 2013-14 season and beyond include his debuts with the New York Philharmonic, NHK Symphony (Tokyo) and San Francisco Symphony orchestras; tours with the Chamber Orchestra of Europe and the Mahler Chamber Orchestra; and return visits to the Chicago Symphony, Berlin Radio Symphony, Cleveland and Philadelphia orchestras, and the Accademia Nazionale di Santa Cecilia. 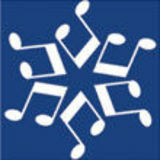 YouTube channel and regular podcasts, the Orchestra has a lively presence on Facebook and Twitter. Cenerentola, Gianni Schicchi, Die Fledermaus, Die Meistersinger von Nürnberg, Don Giovanni and Rachmaninoff’s The Miserly Knight. Other DVD releases include Hansel and Gretel from the Metropolitan Opera; his first concert as the London Philharmonic Orchestra’s Principal Conductor featuring works by Wagner, Berg and Mahler; and DVDs with the Orchestra of the Age of Enlightenment (Beethoven’s Symphonies Nos. 4 and 7) and the Chamber Orchestra of Europe (Strauss and Ravel), all released by Medici Arts. Vladimir Jurowski’s position as Principal Conductor and Artistic Advisor of the London Philharmonic Orchestra is generously supported by the Tsukanov Family Foundation and one anonymous donor. jeAN-eFFLAM BAvouzeT, pIANo Award-winning pianist Jean-Efflam Bavouzet enjoys a prolific recording and international concert career. He is also Artistic Director of a new biennial piano festival set in the stunning scenery of Norway’s Lofoten Islands. The inaugural festival took place in July 2014. Bavouzet records exclusively for Chandos. His recent release featuring the complete Prokofiev Piano Concertos with the BBC Philharmonic and Gianandrea Noseda won the Concerto category of the 2014 Gramophone Awards. His earlier recordings have earned him multiple prizes, including two Gramophone Awards, two BBC Music Magazine Awards, a Diapason d’Or and Choc de l’année. Ongoing recording projects include Beethoven and Haydn Piano Sonata cycles. Summer 2014 sees Bavouzet perform with the Netherlands Philharmonic Orchestra at the Robeco SummerNights in Amsterdam’s Concertgebouw. He also returns to the Tivoli Orchestra to perform concertos by Haydn and Beethoven, directing from the keyboard. He kicks off his 2014-15 season with a U.S. tour with the London Philharmonic Orchestra under Vladimir Jurowski, which includes Carnegie Hall. The season also features his debuts with the Orchestre Philharmonique du Luxembourg under Emmanuel Krivine, the Cincinnati Symphony Orchestra under Louis Langrée and the Orchestra della Svizzera Italiana in Lugano (Vladimir Ashkenazy). He returns to the Orchestre National de France (Juanjo Mena), the Hong Kong Philharmonic, to Japan to work with the NHK Symphony Orchestra and to Australia for concerts with the Sydney and Adelaide symphony orchestras. His Residency at the Orquestra Sinfônica do Estado de São Paulo concludes with a week of chamber music, recitals and master classes. Recent highlights have included concerts with the Pittsburgh and Beijing symphony orchestras, as well as the Bayerisches Staatsorchester and FrançoisXavier Roth in Munich, and returns to the Philharmonia Orchestra, the Manchester Camerata (Gábor Takács-Nagy) and the Warsaw Philharmonic orchestra, where he performed the complete cycle of Beethoven’s piano concertos. He regularly collaborates with conductors such as Vasily Petrenko, Daniele Gatti, Valery Gergiev, Neeme Järvi, Esa-Pekka Salonen, Kirill Karabits, Andris Nelsons, Krzysztof Urbański, Antoni Wit, Yan-Pascal Tortelier and Iván Fischer. An equally active recitalist, Bavouzet returns this season to the Louvre in Paris and London’s Wigmore Hall, and gives recitals in Munich and Budapest as well as Taiwan, Melbourne and Brisbane. Bavouzet has worked closely with Pierre Boulez, Maurice Ohana and Bruno Mantovani and is also a champion of lesser-known French music, notably that of Gabriel Pierné and Albéric Magnard. He regularly collaborates with the Palazzetto Bru Zane and has devised a chamber music program dedicated to the music of Magnard. For more information please visit www.bavouzet.com.